Published: March 2004. Last Updated: August 2011. 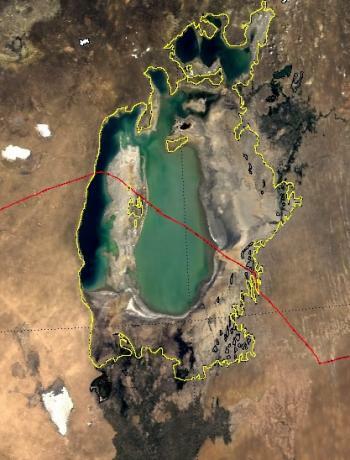 This image shows the Aral Sea on June 3, 2001. The yellow line shows the former shoreline of this shrinking lake. The red line is the border between Kazakhstan to the north and Uzbekistan to the south. This chapter describes how to set a scale and make measurements from digital satellite images. You will analyze NASA images of the Aral Sea, making distance and area measurements to characterize changes in the size of this freshwater lake over time. Using ImageJ, a freely available image analysis program, first, set the scale or spatial calibration of an image, relating a distance in the image to the distance it represents in the real world. Once this calibration is set, you can measure distances or areas on the image and see the measurement results in real-world units. The technique is most useful and accurate for nadir view (straight down) images. The chapter uses image data from MODIS and Landsat instruments. The ability to measure actual distances and areas from images is useful for interpreting unfamiliar features in satellite images. The technique is also useful for quantifying changes such as deforestation and urbanization that occur over time. To set the scale for a satellite image, you will need to know its spatial resolution. Spatial resolution is a measure of the area on Earth's surface that is represented by each pixel, or picture element, in the image. This information is usually available on the Internet site of the satellite instrument that recorded the image. This chapter is part of the Earth Exploration Toolbook. Each chapter provides teachers and/or students with direct practice for using scientific tools to analyze Earth science data. Students should begin on the Case Study page. The EET web site collects no personally identifying information and so is compliant with the Children's Online Privacy Protection Act. The site is constructed with tools that attempt to ensure the broadest possible accessibility in line with section 508 and w3c guidelines.